A mutual fund’s performance and risk can be ascertained by many statistical tools. Among the tools are risk & reward ratios, which help to ascertain the level of risk and reward associated with a particular mutual fund in a given circumstance at a point of time. Here is an overview of Alpha and Beta. What is Alpha and Beta? 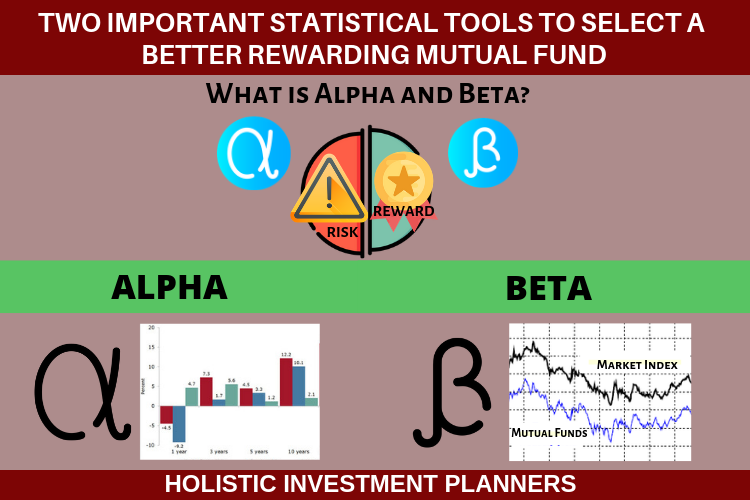  Alpha and Beta are both risk & reward ratios that the investors use as a tool to calculate, compare the returns and risk and to select the mutual funds.  Both the measurements use benchmark indexes and compare them against the individual security or a mutual fund to highlight a particular tendency.  In order to enhance returns from the total portfolio, a desired level of risk has to be consistently maintained and hence one needs to individually select exposure to alpha and beta. Alpha is considered to be a measurement of the portfolio / mutual fund manager’s aptitude. Let us look at an example to understand what exactly Alpha connotes. When the investments made by a portfolio/ mutual fund manager provides a return of 10% for a growth mutual fund, against the overall return of 6% in the equity markets then it is considered to be far more impressive than in a situation where the equity returns are earning 14%. In the first case, the portfolio manager would have a relatively high alpha, while it would be the opposite in case of the second. Alpha is actually the representation of the difference between the mutual fund's actual return and the expected return. It is basically a measure to gauge the level of out performance, or in simpler terms how good or bad the mutual fund has performed when compared to a benchmark. A positive alpha implies that a mutual fund has performed above its yardstick or benchmark index. As in the example above, an alpha of 4 would indicate that a mutual fund has provided 4% higher returns than the market while an alpha of -4 would indicate that the mutual fund has produced 4% lower returns than its market benchmark. A portfolio / mutual fund manager always seeks a positive alpha. Beta is also referred to as Beta co-efficient. It is a tool to measure the volatility of a specific security or a mutual fund by comparing it to the performance of a related benchmark over a period of time. Beta measures the relative risk of a mutual fund or portfolio in relation to the market portfolio. It reflects the systematic risk associated with the mutual fund. The market index has a beta of one. Where there is a beta higher than one, it means that the mutual fund is riskier than the benchmark. Similarly, a beta less than one indicate lesser volatility than the benchmark. A beta of 1.1 signifies that the mutual fund has a volatility of 1.1 times the benchmark volatility. Volatility per se is not bad. Beta suggests that if the individual stocks in an equity mutual fund are chosen in such a way that the cumulative beta stand at 1.2, then, when the market benchmark escalates by 10%, the equity mutual fund is expected to move up by 12% and the converse is also true. What kind of returns can Beta give? In a bullish market, a mutual fund with higher beta will yield better returns for the investor as higher returns for taking higher risk are expected. While in a bearish market, a mutual fund with lower beta would be more appropriate as it is defensive against the market.
? = (0.30-0.08)- 1.1*(0.20-0.08) = 0.088 i.e., this mutual fund has outperformed the benchmark index by 8.8%. It is very important to note that in order that the alpha and beta produce the correct results, the benchmark has to be properly worked out and ready. If an investor were looking to take the advantage of a bullish momentum that he expects in the market, it would be wise to ascertain the beta of various short-listed equity mutual funds, which would eventually help him to choose the right vehicle to participate in the expected market action. If the investor believes that the market has a lot of shares, which are not correctly priced, and there is considerable scope for market correction, then it is likely for him to look for actively managed mutual funds that can locate these “mispriced” opportunities. This will help to make money in excess of what the market makes, over time. Here it is the “alpha” that the investor seeks to achieve – a return in excess of market returns – which is primarily attributable to his superior stock picking skills. If an investor desires alpha returns, by evaluating the past performance of a mutual fund manager and the alpha he has delivered over the incremental expenses over a long period of time, the investor can achieve this objective. Though, this track record may provide a hint to the upcoming performance, it is no guarantee for high returns. If the primary concern for the investor is the near term momentum (upwards or downwards), beta is a better measure to focus on. If long-term out performance and wealth creation are the primary concerns, then the ability and track record of the mutual fund manager in delivering alpha is what you should be looked into minutely.